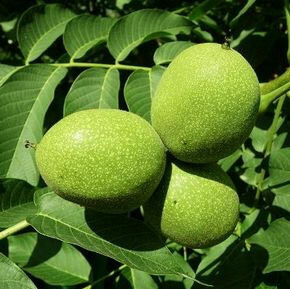 Buy our Walnut N016 tree online from UK supplier of fruiting walnut trees. Juglans Walnut No 16 is a walnut variety from the USA (Obviously it came over when there were no issues with our border control). It is considered a vigorous tree which means it produces lots of growth and it produces large crops of nuts with a good sized Kernel. For those that may suffer with Dyslexia, we mean Kernel as in the description of the outside of a nut not the army rank as otherwise that would mean Colonels grow on trees. The Colonels we have met have all been a bit nuts so that might actually be the case. Fruit should make an appearance around 4 years old but this is not hard and fast. Walnuts are known for being a bit like some of our politicians (slow performers) and could take longer. Expect a height of around 12m although pruning or training could keep this height down. The No 16 is not self-fertile so will need the pollination of another Walnut nearby for it to fruit. Nearby is a relative term dependant upon wind, work ethic of your local bees, if you live in a bio dome etc. In the same garden is perfect anything else is less perfect the further you go. Once you get to around 100m your pollination success starts to diminish. Broadview, Proslavski, Plovdivski and Rita are good pollinators for the Walnut No16 tree. Walnuts can be difficult to establish in their first year and some die back at the shoot tips is to be expected. To improve your chances of getting established quickly, water well and remove all grass and weeds around the base of the tree at approximately 1 metre diameter. Should do well in most soils. All of our Walnut trees listed in the fruit tree section are usually grafted onto Juglans Regia giving a huge amount of benefits. This includes, earlier fruit production (sometimes as low as 2 years), better resistance to die back from UK weather, disease resistance and more shape/size predictability. If you are going to pickle your Walnuts then pick them in late June or early July before the shell forms properly. To improve fruiting you can tie a large cable tie tightly around the base of the tree in May to restrict growth. Remove in Autumn. This process can be done every year until the tree fruits well. For the purists out there, perfect conditions for Walnut trees are at least 90cm of fertile soil, sunny, away from frost pockets, well drained non compacted soil with a PH value of 5.5 to 7.5, sheltered position and well watered although Walnut trees are drought tolerant. If you have doubts about your soil, mix in compost or well rotted manure with the dirt you dug out of the hole. A ratio of 50:50 will be ok.
Walnuts are quite large trees so expect to be using a 7m x 7m plot of land for the larger species and optimal conditions although training and pruning can change this requirement. A nitrogen rich feed or a quality mulch in early Spring will help keep the tree healthy. Walnut shells have interesting uses in industry. They are used for cleaning and polishing soft metals, plastics, wood, stone and fibreglass. As a filler in dynamite, paint thickener and wood of choice for gun handles. It is generally considered a good idea not to grow other plants and trees too close, especially under the trees drip zone as it releases "Juglone" which is a compound toxic to some plants and horses. Birch, Beech and Maple are particularly vulnerable. However, inter-planting with a nitrogen fixing plant such as Elaeagnus × ebbingei, Elaeagnus umbellata,or various Alnus species seems to increase height and girth by up to 30%. Juglans Nigra is particularly bad for this. Juglans Regia although an ornamental tree will produce nuts but will take a long time, possibly up to 20 years. The Walnut fruit tree is thought to be the oldest of our fruit trees, originating in Persia with fossil records dating it to 7000 BC. It is thought the Roman Legionaries introduced it to their Empire which sounds typical. Go away on a foreign excursion and bring something back home you never bargained for! Most Walnut trees are self-fertile which means they will produce walnuts without the need of a different walnut nearby. That being said, having a different species Walnut nearby (closer the better but you could go as high as 1.5 miles away) will improve pollination and give you a better walnut yield. Planting other trees and plants that attract the insects will also help cross pollination. If you are thinking of have a walnut orchard then consider planting 5% of your Walnuts as a different species and upwind of the others. The Walnut fruits will be formed on the new seasons growth. Pruning should be done in the Autumn, before the leaves have fallen and only if absolutely necessary as the tree "bleeds" a lot of sap at the best of times. Dead, diseased or damaged branches should be cut out however those growing inward maybe able to be trained to grow in a different direction by using string or other methods of holding in the desired position. Remember not to tie string tightly around the Walnut tree branch as it will restrict growth. Instead use a loop, rubber tie or other such non restricting method. The most efficient shape for a walnut tree is conical with the pointy end going up. This is to allow maximum light to maximum parts of the foliage which in turn relates to higher yields. This is much easier to achieve on a tree that has a main leader. This is one also called the trunk. A single branch that goes from the ground and all other smaller branches come off that one single branch. The lowest branches are allowed to spread as far as they can and the next branches up are pruned to be a little less wide until you reach the top of the tree and the side branches are cut very short. Should you do this the other way round, the upper branches will shade the lower ones. A bush shaped Walnut tree, one where there are multiple main branches started low to the ground, is best pruned to allow maximum light and air into the centre of the tree. Training side branches to be more horizontal than vertical should also increase fruit yields.